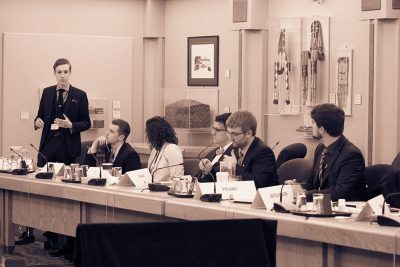 What is Carleton Model NATO? The North Atlantic Council is the principal political decision-making body within NATO. It brings together high-level representatives of each member country to discuss policy or operational questions requiring collective decisions. In sum, it provides a forum for wide-ranging consultation between members on all issues affecting their peace and security. All members have an equal right to express their views and share in the consensus on which decisions are based. Decisions are agreed upon on the basis of unanimity and common accord. There is no voting or decision by majority. This means that policies decided upon by the NAC are supported by and are the expression of the collective will of all the sovereign states that are members of the Alliance and are accepted by all of them. Strictly speaking, the NAC is not the only body within NATO that carries such a high degree of authority. The Nuclear Planning Group (NPG) has comparable authority for matters within its specific area of competence. However, in practice, the NAC convenes far more frequently than the NPG and covers a broader scope of themes – as broad as the member countries decide it should be. Consequently, it is commonly referred to as NATO’s principal decision-making body. The Military Committee (MC) is the senior military authority in NATO and the oldest permanent body in NATO after the North Atlantic Council, both having been formed months after the Alliance came into being. It is the primary source of military advice to NATO’s civilian decision-making bodies – the North Atlantic Council and the Nuclear Planning Group.Its advice is sought prior to any authorization for military action and, consequently represents an essential link between the political decision-making process and the military structure of NATO. The Committee on Proliferation (CP) is the senior advisory body to the North Atlantic Council on proliferation of weapons of mass destruction (WMD) and their associated delivery systems and chemical, biological, radiological and nuclear (CBRN) defence. The CP is responsible for information sharing, policy development and coordination on the issues of prevention of and response to proliferation, bringing together experts and officials with responsibilities in this field. The Committee addresses the threats and challenges stemming from WMD proliferation, as well as the international diplomatic responses to them. In its defence format, it also discusses the development of military capabilities needed to discourage WMD proliferation, to deter threats and use of such weapons, and to protect NATO populations, territory and forces. It cooperates with other NATO bodies with competencies in the area of WMD and CBRN defence. The 50-nation Euro-Atlantic Partnership Council (EAPC) is a multilateral forum for dialogue and consultation on political and security-related issues among Allies and partner countries. It provides the overall political framework for NATO’s cooperation with partner countries in the Euro-Atlantic area, and for the bilateral relationships developed between NATO and individual partner countries under the Partnership for Peace (PfP) programme. Longer-term consultation and cooperation takes place in a wide range of areas within the framework of the Euro-Atlantic Partnership Work Programme (EAPWP).These areas include crisis-management and peace-support operations; regional issues; arms control and issues related to the proliferation of weapons of mass destruction; international terrorism; defence issues such as planning, budgeting, policy and strategy; civil emergency planning and disaster preparedness; armaments cooperation; nuclear safety; civil-military coordination of air traffic management; and scientific cooperation. The EAPC has also taken initiatives to promote and coordinate practical cooperation and the exchange of expertise in key areas. These include combating terrorism, border security, and other issues related to the proliferation of weapons of mass destruction and small arms and light weapons. New to Carleton MNATO is the addition of the fast-paced Civilian Emergency Planning Committee (CEPC). This committee is the top NATO advisory body for the protection of civilian populations and infrastructure against terrorism and humanitarian disasters. Delegates on this committee will work closely with their teammates to provide advice and expertise on the practical implications of actions taken in response to both regular Committee developments and Crisis response.